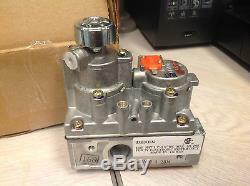 Hearth and Home Dexen ipi valve part number 750-500 for natural gas only. This will not work with DSI, HSI or standing pilot units. For use in Heat-n-glo and Heatilator fireplace. GDCR60i & GDCR60Li - After serial # GA1548727. Heat & Glo Gas Fireplaces. ESC-42ST - Pre serial # 0022120860. EVEREST - After serial #5000. We aren't happy until you know where your package is and when to expect it! Your satisfaction is important to us. The item "Hearth & Home Dexen ipi Valve 750-500 NG, Gas Fireplace, Heat & Glo, Heatilator" is in sale since Sunday, November 11, 2018. This item is in the category "Home & Garden\Home Improvement\Heating, Cooling & Air\Fireplaces & Stoves\Replacement Parts". The seller is "builderbuddies" and is located in Byron Center, Michigan.